Ghost Walks are done for the year. As I look back at all the tours my co-worker Bianca Jorgensen and I have worked this year I realize that we have been very busy. 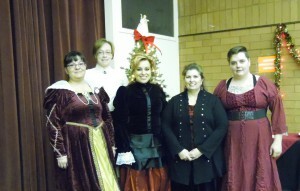 We have held regular walks, special private walks and of course our special holiday event Ghosts of Christmas Past. This year’s Ghosts of Christmas Past event was very nice. Thanks to the Sweetwater County Library System Foundation for helping with funding which allowed us to hire the magician Elias Caress and his wonderful assistant. Elias is based in the Salt Lake City area. His specialty is magic and variety entertainment. 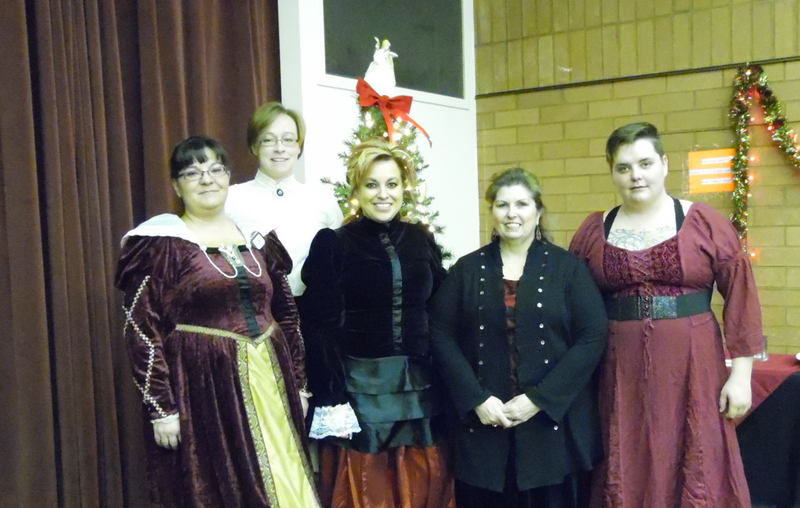 Our Ghosts of Christmas Past is done with a nod to Charles Dicken’s and his work. Unbeknown to us, Charles Dickens was also a magician. Elias did some special research and brought with him a few tricks that were believed to have been performed by Dickens during some home entertainment. The patrons were excited to be part of the pre-show warm-ups. It is always fun to be baffled by a magician and then he offers to share the secrets. Wow. Everyone was very excited, but of course there is always a last minute trick. It was all great fun. Along with the wonderful entertainment we were also able to purchase beautiful glass mugs for each attendee to take home. It is always a pleasure to see the happy faces of the patrons during this event. We would like to send out a special thank you to some of our Ghost Walk Volunteers for working the event with us. They not only help with the actual walk but they contributed to the decedent dessert samplers that we provide for the patrons. We greatly appreciate Tiffany Kennah, Kenedie Grant and Ursula Krentz for all they have done for us. The treats that they brought were yummy. The ladies come any time we need them. They have their own ghost hunting equipment and are very knowledgeable about thing paranormal. To top it off, they also are always willing to help set-up and take down tables, decorations, etc. What a crew! If you have ever been to one of our events you may have met some of the volunteers. Along with these three ladies we also have several other volunteers Emily Beitel, Hannah Yeager, Kyle and Shalise Lamb, and Ian and Sami Doak. We are so lucky to have a group of dedicated assistants to work with. It makes our job so much easier. We would also like to take this time to wish our patrons and everyone that has attended the 2015 Ghost Walks a very happy holiday season. May you’re the New Year also be all you wish it to be. The Sweetwater County Library is, as you know, haunted. Stories have been told and retold since the building of the current library began. The workers heard voices and noises that were unexplained, tools would go missing and show back up later, and many felt a creepy feeling while trying to work. At least one worker walked off the job. The library is one haunted location, but there are others. We are not alone (no pun intended). You will not be surprised to learn there are many reports of ghosts/spirits being seen in the Riverside Cemetery just up the hill from the library. I have had several locals approach me telling their person ghost story. Two local ladies once worked at the cemetery when they were teens for the City of Green River Parks and Recreation Department. Their jobs were to help maintain the grounds at the cemetery. They did not work there at the same time, but their stories are very similar. Both ladies reported seeing a small boy riding a tricycle along one area of the path. They heard him, then saw him, then he was gone. Along with this one of these same ladies and a local man also reported seeing an elderly gentleman. The man stated that this “gentleman” actually spoke to him and disappeared. Just this last month another man was walking a dog around the fences at the cemetery. The dog is high energy and she “decided” for them that they were going inside the fences. Once there they began walking down the path on the west end towards the front gate. There was no warning when suddenly the dog stopped, lowered her head and began to growl. He looked carefully and there was nothing there. Not a rabbit or deer or squirrel. Just nothing he stated. The dog would not move for at least fifteen minutes. She just kept staring like something was just ahead of them. It gave the man the chills. He had never experienced anything paranormal before and asked me what I thought. I said “Welcome to the world of the paranormal”. The Sweetwater County Courthouse is also reportedly haunted. Bill Hutton was a well-known man that worked at the courthouse as a grounds keeper many years ago. After Bill’s death several of the county employees mentioned that they if fact saw him walking around. He was a dedicated employee and it would be his way to keep an eye out on thing. Mi Casita is a local Mexican restaurant. The business space has also been Sage Creek Bagel. While it was Sage Creek, several of the employees witnessed a vase fly off a shelf. They stated they had heard noises and a lady’s voice. I once worked in the space when it was American Electric many years ago. I did not have any paranormal experiences then nor did I hear of any from co-workers. There is speculation as to why the lady was around only during the time of Sage Creek Bagel. Sadly, the old Lincoln High School/Lincoln Middle School burnt to the ground some years ago. This made many of us sad. I graduated from this school and loved it. Some years before the fire an All-Class Reunion was held. Many of the old students and employees came to enjoy the fun. While there they began talking and looking at old photos from the yearbooks. Several of the custodians pointed to a photo a teacher that once worked there in around the 50’s & 60’s. They told the others that they used to see her ghost walking the school hallways. Once other story also was brought up. Several people told of a story of someone seeing a ghost girl in the auditorium area. Since then, it was brought to my attention that this was something a teacher made up to see how many students would repeat the tale. One other business in town (then does not want named) has also had its share of ghostly sightings. When a change is close to happen, one particular man that died years ago is seen. This is always a shock for the staff and they always know to be ready. He seems to be there to help. Enough people have witnessed this that it is now part of the businesses lore. All the employees know about him. Beyond ghosts, there are stories of other things locally that are unexplained. I know of at least two people that have seen what they describe as a “UFO” hovering over the hill known as Mansface Rock. They stated that this object is very bright and just seems to stay in one area for several hours and then is gone. If this were a planet or satellite it would move slightly with the earth’s rotation. Other reports have been made of seeing “UFO’s” down the river from the City of Green River. They would move in ways no known aircraft does. Down river, a few miles is FMC Park and close to it is Stratton-Meyer Park. In this area some of the local kids were having a “kegger” and they noticed something moving around them. At first they thought it was the beer affecting their sight, but when several young people there reportedly saw the same thing, they became nervous. They described short “little people” watching the. Several similar stories have reached me that a “werewolf-type” animal was also sported there. There is no proof of what they saw, but all of the people reported seemed unnerved. Whether you believe in ghosts, UFO’s, little people or werewolves, when people begin telling stories more seem to follow. 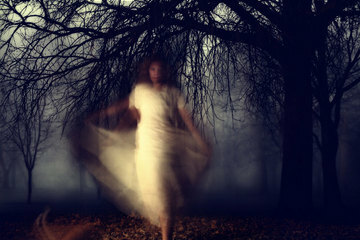 We all know that not everything is paranormal and there may be a good explanation for some of these things, but not all. If you are like I am, I keep an open mind and listen when someone is brave enough to come forward. It is not easy when you are about to relate a story when you think the person you are telling will laugh at you. I am not that person. I will not say I believe everything I am told, but I know from experience that, there is a lot out there that is the real deal. I have seen, heard, felt and sensed ghosts here at the library. They are for real. We are very lucky that we are able to co-exist in a friendly manner. This is why we never allow provoking in our building. We have men, women and children spirits here. Working here has been an experience to say the least. Do you have a story about Green River or Sweetwater County? Please let me know.